Olive Films has yet another dazzling collection of Paramount-licensed Max and Dave Fleischer cartoons in Betty Boop: The Essential Collection, Volume 4, 13 more razor-sharp one-reel shorts. As with Volume 3, they span Betty's early peak years, from 1932, focusing mainly on its 1934 season, and the series' slight decline through 1938, with Betty unceremoniously off on the sidelines while the Fleischers attempted to establish new cartoon stars. This collection generally shows off Betty at her absolutely best, however, highlighted by an amazing color adaptation of Cinderella, a short that, all by itself, is worth the price of the disc. Most of these cartoons feature early TV syndication titles replacing Paramount's originals, though several here happily include the original Paramount logo. Moreover, the picture quality remains supremely high and, overall, this is a real feast for the eyes. But Betty's best, the two-dozen or so cartoons from 1932-34, and even many of those made later on, positively ooze the Fleischer house style, one more adult and far more surreal than their rivals, with imagery at times more Dali than Disney. As animation historian Leonard Maltin and others have pointed out, where Disney exploited the natural fears of children, the Fleischers' cartoons explore the darker psychology of adults. Though hugely popular in their day, probably because the Betty Boop cartoons were made in black and white, their marketability has nonsensically been limited in recent decades. Further, like various Popeye cartoons and most (all?) of the Superman cartoons, many Betty Boop shorts apparently have fallen into public domain, and home video versions of those shorts have been of variable quality. Happily, the shorts here have been remastered in 4K using the original negatives and, in some cases, fine grains. Most are missing their original Paramount logos and credits, and where those exist the majority are doctored. Presumably that's because their original negatives were cut in order to release the picture (but not the audio) with the logo of the U.M.&M.TV Corp., who syndicated the cartoons beginning in 1955. What's important though is that these logos aside, the shorts themselves all look fantastic, especially considering their age, convoluted ownership and distribution history. Included this time are: Stopping the Show (1932), Snow White (1933), Parade of the Wooden Soldiers, She Wronged Him Right, Red Hot Mamma, Poor Cinderella, There's Something About a Soldier, When My Ship Comes In (all 1934), Zula Hula (1937), Riding the Rails, The Swing School, Pudgy the Watchman, and Sally Swing (all 1938). Wikipedia describes Stopping the Show, the first official "Betty Boop Cartoon" (though she'd appeared in earlier Fleischer shorts), as set in a Vaudeville house but that's not really correct. In fact the best thing about this short is that, in cartoon terms, it describes what going to the movies was like in the early 1930s. It begins with a movie audience watching a faux newsreel followed by a cartoon (featuring Bimbo and Koko). Then, as was common in the big downtown movie palaces of the time, what follows is a limited stage show. In footage featured in the later Betty Boop's Rise to Fame (available as part of a previous volume in this series), Betty does a pair of celebrity imitations: Fannie Brice and Maurice Chevalier, whose real voices introduce Betty's imitations of them. 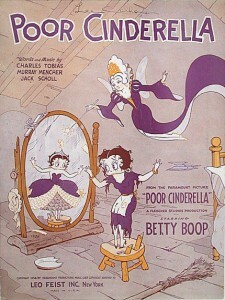 Originally the short also featured Betty imitating singer Helen Kane, but her lawsuit over Betty's supposed resemblance to her forced the Fleischers to cut that bit. Next up, and featuring the Paramount logo, is Snow White, as far removed an adaptation from Disney's later, more famous version as could be imagined. Animated primarily by Roland Crandell, it's Betty Boop at her surrealist, jazziest best. The highlight of this dizzyingly bizarre cartoon has Koko transforming into a ghost-like monster that sings "St. James Infirmary Blues" (performed by Cab Calloway, whose dancing was rotoscoped). Next is Parade of the Wooden Soldiers, featuring violinist David Rubinoff and His Orchestra. Rather than riff Laurel & Hardy's yet-to-be-released Babes in Toyland, this short seems directly inspired by Disney's wondrous Santa's Workshop, released one year earlier. In Fleischer's version, Betty is threatened by an enormous King Kong stuffed toy. As with other Fleischer shorts from this period, there's a bit of rotoscoping, this time for a dancing rag doll. She Wronged Him Right, a play on Mae West's She Done Him Wrong, is a spoof of 19th-century melodramas such as The Drunkard. Betty stars in the stage production, as an ingénue unable to pay the mortgage (natch) and threatened by Heeza Rat, whom the management encourages the audience to hiss at. (My six-year-old did just that.) The short introduces Betty's semi-regular boyfriend, Fearless Fred, playing the hero. Unfortunately, Fleischer's animators aren't really up to the task of drawing a dashing hero. In this short he bears a striking resemblance to Stockard Channing! Red Hot Mamma is taut and funny, with a shivering Betty building a roaring fire on a cold winter night, leading to a nightmare where she's transported to Hell. Released in early 1934, this short exhibits much more sophisticated animation (this time by Willard Bowsky and David Tendlar) than most of its predecessors. The disc's highlight unquestionably is Poor Cinderella, a lavish short stretched to 10 minutes. Unlike Snow White it's a pretty faithful adaptation, comparing favorably to Disney's 1950 feature film. The cartoon shows off all the Fleischers' innovative animation techniques, including its stunning Rotograph/Stereoptical Camera/Setback process (apparently it was called all of these things at one time or another) in which the camera shot through hand-painted animation cells revealing behind them, in place of traditional two-dimensional backgrounds, elaborate three-dimensional miniature sets, adding an uncanny realness to the animation. Usually Fleischers' shorts would feature no more than 20 seconds or so of this technique, but here it's in several long takes: Cinderella's ride to the castle, her ballroom dance, etc. Poor Cinderella was also Betty's only color cartoon, filmed in a process called Cinecolor. Disney had an exclusive license on three-strip Technicolor through 1935, forcing the Fleischers to utilize the more limited two-strip Cinecolor, It produced vibrant reds and blues, but faltered with greens and purples. For this reason Betty's hair is "dyed" red for this short. All previous TV and home video versions of Poor Cinderella look faded and fail to impress, but this transfer is almost unimaginably vivid. It has a completely different look from three-strip Technicolor but, on its own term, positively dazzles. Next is There's Something About a Soldier, more curious than impressive, with Betty leading a recruiting drive by offering kisses to anyone who enlists, though her heart belongs to Fearless Fred. A battle with giant mosquitos ensues but mostly it's strange to see this sort of story in a 1934 Hollywood movie, between World Wars and in a climate of growing isolationism. When My Ship Comes In is an amusing, gag-filled short with Betty winning a million dollars in a horse race sweepstakes, money she gleefully spends to combat the Great Depression. Flash forward to December 1937's Zula Hula, officially a Betty Boop cartoon but equally a vehicle for the Fleischers' Grampy, a forever cheerful inventor of Rube Goldberg-type contraptions. In this, their ‘round-the-world flight, obviously patterned after Amelia Earhart's unsuccessful attempt (and unexplained disappearance) earlier that year, is cut short when their plane crash lands on a Pacific isle populated by (black) cannibals. Grampy comes to the rescue by fashioning a calliope out of the wreckage, inspiring the cannibals to swing it in politically incorrect fashion. Riding the Rails has a strong New York flavor (where Fleischers' studio was based at this point), with Pudgy, Betty's pup, getting lost in the city's labyrinthine subway system. Though there's a lot more Pudgy than Betty this time, the short is funny, exciting, and quite evocative of the period. Pudgy also dominates The Swing School, as a pupil at Betty Boop's Music School for Animals. This is a gag-filled short marred somewhat by the strange decision to depict Betty as a short-tempered disciplinarian. Pudgy the Watchman is more like a proto-Tom & Jerry short than classic Betty Boop, with Pudgy's status threatened when Betty hires "mouse eradicator" Al E. Katz to deal with the household rodent problem. This and the last short feature Kate Wright and Margie Hines, respectively the least Betty-like voices among the various Boops. Sally Swing exemplifies how by 1938 Betty's time had passed. The flapper and jazz baby plays second fiddle to the title character, a jitterbugger voiced nonetheless impressively by the one and only Rose Marie (who has recently turned 91). The clash of changing tastes in music, fashion, and even animation itself (Betty is slightly altered here, looking a bit more proportionally human) sadly sees Betty lost in the rush to modernization. As described in more detail above, Betty Boop - The Essential Collection, Volume 4 consists of 13 one-reel shorts on a single Blu-ray disc. The shorts, remastered in 4K from their original negatives and fine grains, retain the spliced on U.M.&M.TV Corp. logos some of the time but otherwise look spectacularly good. As noted above, the Cinecolor Poor Cinderella alone is worth the price of admission. The DTS-HD Master Audio English mono soundtracks sound good considering their age and technical limitations. No subtitle options and no Extra Features. Another must-have for animation buffs and a set guaranteed to enchant children and adults alike heretofore unfamiliar with these phantasmagorical cartoons, Betty Boop: The Essential Collection, Volume 4 is a DVD Talk Collector Series title.